Talk to to Almera in her house west of the Coal Trucks and north of the Baxtorian Falls. See the beginner's guide for methods on getting near here safely. Find Almera in her house at #1 in the image and talk to her. She will mention the raft out back. Ride on the raft, you'll end up crashing. Talk to the boy nearby and he'll refuse to help you. Click at the edge of your island down river to begin swimming to the other island. You will wash up in front of a visitor's center, #2 on the image. Go inside, exhaust all of Hadley's dialogue and read the Book on Baxtorian in one of the shelves upstairs until your quest log updates. Go to the Tree Gnome Village (the fastest and cheapest way of getting there being a Ring of Dueling teleport and running northeast from Castle Wars, or you can just run south through Ardougne) and go down the ladder at the end of the maze. You may want to bring some armour and food just in case, as there are hostile monsters in the maze that can kill low-level players. If you did step 4 incorrectly, your character will say "It looks scary down there!" when you attempt to climb down the ladder. You need to make sure that you click on EVERY dialog option from the tour guide. In the room on the right from when you enter there should be some crates that seem out of place. Search them for a key. 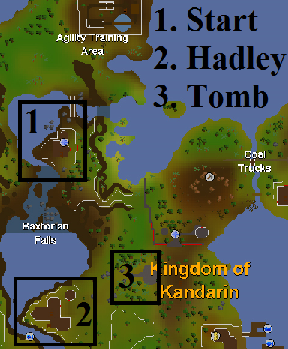 Bank all your combat items including runes and head to Glarial's Tomb located at #3 in the image near Hadley's visitor's center. Use the Pebble on the Tomb to enter. Once inside the tomb, run west past the moss giants and search the chest for the amulet. Head south after grabbing the amulet, and search the tomb for Glarial's Urn. You can now get your combat gear and food, as well as your rope and the runes you need. Head back to Almera's house, and board the raft again. Use your rope on the rock, and then click 'climb dead tree'. Once inside the dungeon, head to the eastern room and grab the key from the crate. Now head to the northwestern room. Lower levels may want to attack and aggro one of the Shadow Spiders before running past the Fire Giants as the spiders can only two-shot a 10HP player at best, while a Fire Giant can one-shot them. With the aggro gained from attacking the spider, you are given a brief moment which prevents you from being attacked by a Fire Giant. Book it to the door as soon as the spider fights back. Place an earth, water and air rune on each of the pillars then use the amulet on Glarial's statue and then the urn on the Chalice. Click the Chalice again to complete the quest!